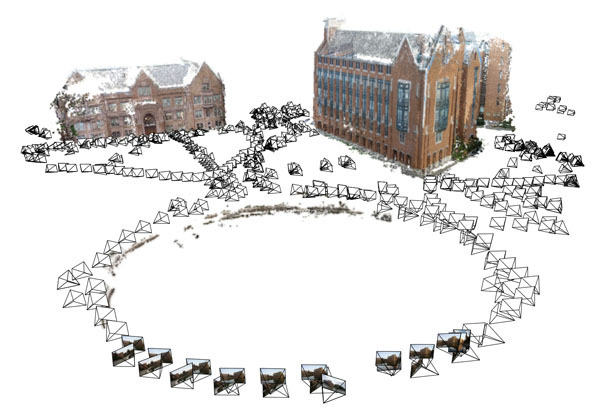 First there was Photosynth, a collaboration between the University of Washington and Microsoft that constructs 3D models of points of interest from hundreds of tourist photos, allowing those photos to be "navigated" in 3D space. Now there is PhotoCity, a collaboration between the University of Washington and Cornell University that hopes to construct 3D models of entire cities and university campuses from hundreds of thousands or millions of photographs. PhotoCity builds upon work done as part of the "Rome in a Day" project -- a successor to Photosynth. The algorithms have been improved. The computational back-end has been scaled. The project is being driven forward by a web-based "virtual 'capture the flag'" game involving students at UW and Cornell. The potential for "capturing the world" in 3D, through millions of photographs which can be "navigated" in 3D space, is enticing!